Stephanie Maloof Tsalagas, a second generation artist who followed her mother's steps began drawing at the age of 4. She was born in the South End of Boston, Massachusetts and has been a lifelong resident of the city. Her talent was apparent and recognized early. At the age of 15, still in high school she won her first award and was capturing portraits and still-life imagery on canvas. Mrs. Maloof Tsalagas became a visionary artist through many decades of commitment, patience and dedication for her work. She started traveling around the world early in her life and that helped her improve. She educated herself with various cultures while she was studying techniques and being tutored from many Art Masters. 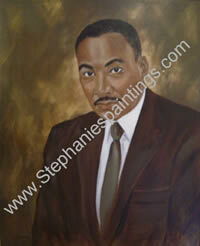 The Artist has demonstrated her work in many exhibits locally, nationally and internationally. Stephanie Maloof Tsalagas has received many awards and recognitions from various organizations and groups. 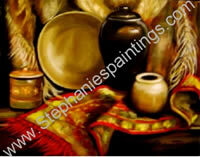 Many Art Collectors have acquired Stephanie's artwork and most of her international exhibited paintings have been appraised by world renown accredited appraisers. The European artist of the year has mastered different styles and techniques while working with pastels, acrylics, and oils. Her most noticeable award is the prestige artist of the year award in 1996 in Europe. Her self portrait was recognized and rewarded the gold medal among 490 world renown artists. 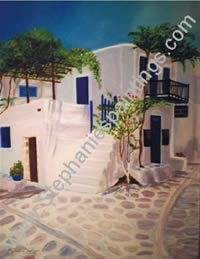 She continues to paint portraits, animals, landscapes, seascapes, still-life and commissions her work. Her paintings have been seen in most states in United States and various galleries in over 14 countries in 3 different Continents.